Think You’re Safe From The GDPR Outside Of The EU? Think Again! I’m sure by now you’ve seen “GDPR” in the headlines. 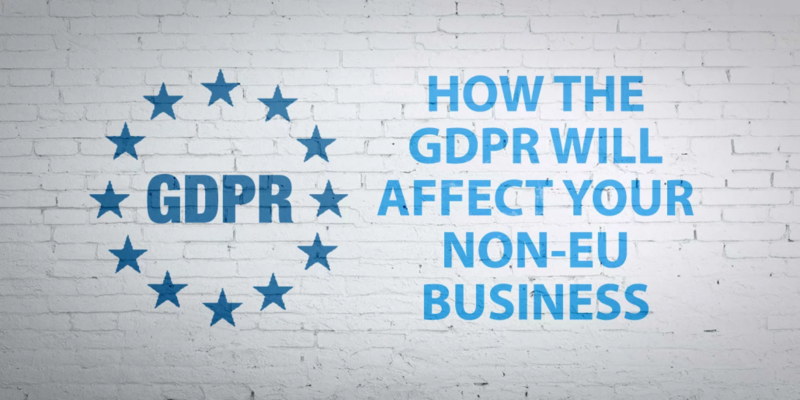 The GDPR, or General Data Protection Regulation is a set of new laws intended to strengthen and unify data protection for all individuals within the European Union (EU). It came into effect on May 25th 2018. It is new legislation relating to personal data and how it’s stored. If your business is not based in the EU, you’re probably thinking you don’t need to worry about it, right? It’s European legislation but it will affect website owners outside of Europe. If your website is visited by people in Europe (or your code is used by websites that do), the GDPR covers you. The penalties for non-compliance are pretty harsh – up to 4% of global annual turnover or €20 Million (whichever is greater). If you run a small business that collects data for sales and/or a mailing list, that’s a LOT of dolla! Ok… So Now I’m Freaking Out!!! Don’t panic!! No one is going to come knocking down your door if you weren’t compliant by May 25th. The only way you can get in trouble for not being GDPR compliant right now is if someone complains to the EU’s Information Commission Office (ICO) about you. You’ve got time to get up to speed. A financial transaction doesn’t have to take place for the extended scope of the law to kick in. If the organisation just collects “personal data” – EU-speak for what we in the U.S. call personally identifiable information (PII) –as part of a marketing survey, then the data would have to be protected GDPR-style. So the moment a user accesses your site from an area where the GDPR is in effect, you’re subject to the GDPR. Server location is irrelevant – user location is what’s important. So, if a user from somewhere in the EU accesses your website from their home turf, you are required by law to comply with the GDPR. If your website visitor leaves the EU, flies to the Cayman Islands and they visit your site, the EU has no authority. It’s all down to where they access your site from. Each point is subject to all sorts of caveats and exceptions as to how much you need to do, but this is a good starting point. Increased territorial scope: This means that the legislation affects not only businesses and organisations operating in Europe, but also those ‘processing the personal data’ of people living in the EU. Which is most websites around the world. Consent: We all know how important consent is! If you’re collecting data the person whose data you’re collecting must consent to you doing so. This doesn’t just apply to data gathered from forms but also to data collected in the background such as IP addresses, but only to the level that it can be associated to an individual. Right to access: Individuals will have the right to access to their data and to information on how it’s being processed and used. Privacy by design. This means that instead of bolting on data privacy, it will have to be incorporated into the design of a system from the outset. Check back here in a few days to read out post on How To Make Your WordPress Website GDPR Compliant. Get compliant and good luck! https://code-websites.com/wp-content/uploads/2019/02/how-the-GDPR-will-affect-your-non-EU-business.png 768 1536 Adam Cockerill https://code-websites.com/wp-content/uploads/2018/02/logo-CODE-websites-white-2-300x90.png Adam Cockerill2018-06-21 14:26:332019-02-14 14:28:09Think You’re Safe From The GDPR Outside Of The EU? Think Again!